You would have a very difficult job to separate Bruno – one of the largest working dogs in the world – from his mistress…unless he is needed on a hillside. The pre-dawn picture is a tribute to all those who must get ready to work today; emergency services, doctors and nurses, mountain rescue teams, soldiers, aircrews, sailors (military and merchant), their civilian backups, as well as farmers and shepherds feeding and tending to stock and those caring for sick and wounded animals. At home you may notice a few new and some very old faces in the news broadcasts since all the highly paid regulars have read their contracts and gone home for the binge. Today’s the day freelancers get to shine. 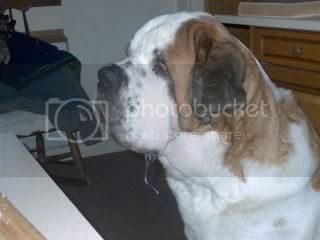 Bruno the Saint Bernard is actually sitting and drooling because he hopes the toast eater at the breakfast table (below his jaw height) will spot him and reward him before he is blamed for the damp patch at his feet. Then both are out to the hills in darkness for the daily training run. It’s Christmas Day – so he could get lucky on the toast. We hope you are fortunate too, today, throughout the holiday and the 2012 New Year. Those of you in London who are today preparing for the Olympics…enjoy calm of it now…the frenetic activity and final monstrous bills will all come later. Meanwhile, Bruno is in the high country, relaxed but working, watching and waiting for that call which might never come.